Inland Design as an in-house co-design team in Migri is now one and half years old. We are still making our first steps. At the same time, we try to understand how we do our work. This is partly thanks to our interns who have made us slow down and analyse our work as part of their master theses (you can read about Kristin’s work here and about Anna’s work here). It is a conscious decision to formalise the work of a design and innovation lab in the context of a governmental agency. If we want to be able to scale up and recommend others to follow our steps, we have to constantly document our way of building this team and our working practices. Let’s go to the point: how do we work? We currently have four operating models. In this operating model we take ideas for projects from immigrants, a Migri unit or Migri’s stakeholders and try to make them happen. This means we invest a lot of effort in the beginning of a project, but step by step we fade out. This means that other project teams take over responsibility as the project goes on. In the next phase of the project Inland and another team work together and share the responsibility: Inland is participating in the project as an equal partner and full member of the project team. After the handover of the main responsibility Inland may be part of the project in different forms: We may consult or be a normal member of the project team. In the case of Kamu, Migri’s chatbot, we worked a lot before a dedicated team in the digital services unit started and slowly took over the main responsibility of the project: We created a vision and a concept, worked on the personality of the chatbot and got different stakeholders within the organisation onboard. For a period of time we worked in parallel with the dedicated ENNI-team in the digital services unit. In the next (and current) phase of collaboration, Inland continues to participate in key decisions and periods: We evaluated the chatbot pilot, and now continue to facilitate the planning the next steps and give recommendations for future development. Inland also consults on user tests and usability and takes a key part in leading new experiments that take place within this team, e.g. the ongoing Kamu voice experiment. In the case of Starting up smoothly, we still have a key role. Inland coordinates the project between the three organisations. In 2018 we were leader of this project but now, in 2019, we share more and more responsibility with the dedicated team in Migri’s digital service unit as well as the teams in Vero and PRH. The long-term operating model within this team will depend on the future of this project. In this operating model the projects are initiated and led by other stakeholders in Migri. Inland is asked to take part in these projects to bring its service design expertise. Inland joins these projects as a full team member in very early phases of the project and often also shapes the project itself. From the beginning we work in cross-disciplinary project teams, with Inland being a full team member. In these projects our tasks often include user research and its analysis, clarifying goals, facilitating workshops and visualising outcomes. For us, Inland’s key role in these projects is ensuring an iterative and collaborative process. A Migri-internal team called KEPA (kehityspalvelut — development services) asked us to help in developing cards to facilitate the development discussions. These cards have questions on three topics: well-being at work, career development and learning. These questions support the development discussions. We have designed the cards and improved them based on feedback from staff as well as the management level of Migri. The final cards have been created and can be used during the development discussion. In these projects we are consultants.This means that we never become full members of the project team, but remain in a more distant role. Consulting can take different forms and take place in different phases of the project: Inland might help to build the project plan by co-creating the roadmap and specifying user research and testing. In other cases we participate in key project meetings or simply give comments on intermediate outcomes. What is key in this operating model is that we do not take independent action on or responsibility over any deliveries of these projects. Through our Service design Ambassador training we have built a framework for the participants to work. 30 civil servants worked on their own projects as part of their training. Our role was in teaching a design process where end users are involved in different phases of the design process. In the individual projects, we gave advice on how to proceed at key moments and project teams themselves decided which advise to take and which one to leave. 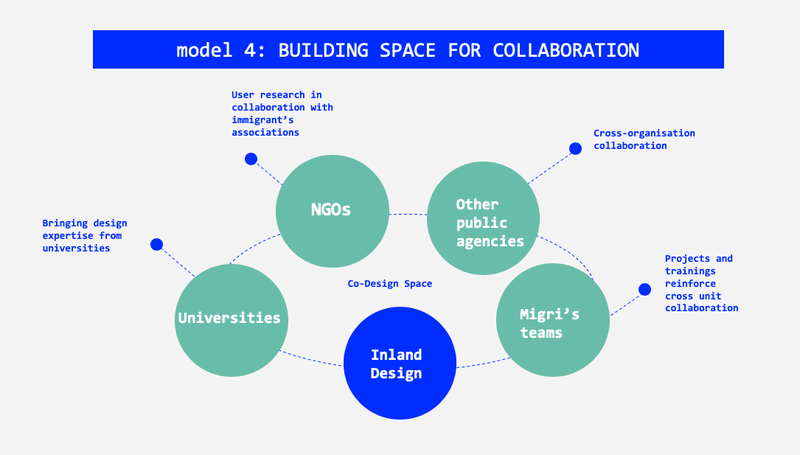 In this model Inland acts as a connector between design expertise from academia, NGOs, other public agencies or different teams in Migri. The work that we do in this operational model might not be in the form of projects but it could also be initiatives. For us, creating this co-design space is important for thinking in future endeavours. We connect Migri with academia in different ways: a) through our interns, b) through projects, and c) through the production of events. Up until now we have had two rounds of interns at Inland. They spend six months as part of our team write their masters thesis about Inland’s work. Students get guidance for their masters thesis, a topic to work on and real experience as service designers in the Finnish public sector. As part of particular courses, we have given tasks to students and received very good results. especially when a student group they have done an in depth usability testing of our digital services. In these cases, teachers of design-related courses ask us to give feedback to students. These courses might be rather short and intense or stretch over a longer time period. According to the students involved, it was interesting to be able to work in a project for the government. During 2018 we collaborated in the production of several events with a professor in Aalto University. For example, we invited a designer from Estonia to an event called “Innovation and Design Labs in the Government”. We and the Estonian civil servant shared our expertise around the topic to designers across Finnish public sector as well as Migri workers. When we started to work in Migri, we only had one operating model (model 1). In 2017 we wrote about this in an article. Nowadays, there are different ways in which we collaborate to innovate at Migri. We see this as a big achievement and part of the development of our team’s working practices. These different operating models describe how Inland is working and tells how we see Inland: We are an integral part of the organisation. We want to influence projects and the working culture at large. For this reason we do not concentrate our resources only on a few main projects, but choose to spread our time among many. In practice it means that some of our team members work intensely using the first of the operating models, while others work more in consulting, participating and bringing design expertise from academia. We make a special effort to collaborate with different units and for that we need different operating models. We believe that we have to continuously expand our network of collaborators within Migri and with other public agencies through these models. Having different operating models helps Inland serve Migri better. We are flexible partners that accommodate the varying needs of different teams. Even more importantly it demonstrates that Migri has embraced us within 1.5 years since Inland was founded. We are now constantly asked to participate in projects lead by other teams. Working this way we believe we can have the biggest impact as designers in Migri.